Geneva Roberta Fitzgerald was born February 9, 1935 in Nottoway County, VA to the late Arthur and Hattie H. Fitzgerald. After a brave fight, the Lord called Geneva home to rest. She was predeceased by sisters, Alice Mae, Arlene and Brothers, Lewis, Clifton, William and Moses. Geneva was baptized at the Old Mt. Nebo Baptist Church. She had dual membership with Mt. Nebo Baptist Church, Blackstone and also with Mt. Enon Baptist Church, Baltimore, MD, Dr. Arnold Howard, Pastor. Geneva was educated in the Nottoway County Public Schools. She was Valedictorian for Luther H. Foster High School, class of 1952. Geneva was an outstanding athlete on the Girls’ Basketball Team. After high school she briefly attended Hampton Institute, Hampton, VA on a scholarship before returning to Blackstone to care for her mother. 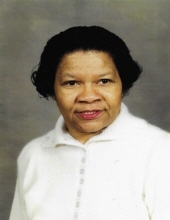 Geneva retired from the State of Maryland in 1998 after working at the Baltimore Harbor Tunnel and a Claims Department Examiner for Maryland Social Security Administration for a combination of over fifty years. While employed with the SSA, she was a player and coach of their softball team. Geneva enjoyed coming down to the Fitzgerald’s Family Homestead, frequently spending weeks there. She loved landscaping, socializing, looking at sports (baseball and football) and discussing the latest news. She was the family “chief historian” and a pro at couponing. All would say Aunt Gen’s deserts were the best. She will fondly be remembered as independent, strong willed, opinionated, stern, helpful and generous. We will miss her dearly. Geneva is survived by her brother, Bennie W. Fitzgerald (Valerie) of Camp Springs, MD; sisters-in-law, Esther M. Fitzgerald of Blackstone, VA and Mae West Fitzgerald of Baltimore, MD; a host of nieces, nephews, great nieces and nephews, great-great nieces and nephews, cousins and friends. Special recognition of supported neighbors and friends, Mrs. Edna T. Conigland, Mary and Joe Payton, Naomi and William Harris, Naomi Myers, all of Baltimore, MD and Lessie E. Jennings of Crewe, VA. Viewing Friday, September 28, from 10:00 am to 8:00 pm. Funeral Services Saturday, September 29, 2018 at 12:00 Noon at Mt. Nebo Baptist Church, Blackstone. Interment church cemetery. To plant a tree in memory of Geneva R. Fitzgerald, please visit our Tribute Store. "Email Address" would like to share the life celebration of Geneva R. Fitzgerald. Click on the "link" to go to share a favorite memory or leave a condolence message for the family.